When I started writing about art in this magazine, I thought I was perhaps “the only artist in the village” – apologies to Little Britain! But of course this is far from the case – it turns out that there are many artists and crafters of all sorts in our locality and I am so pleased not to be the only one. Some are involved full-time and others take part maybe in just one class each week. There are a lot of us about. For example, I’ve only recently met Terence Clarke, a very well-known artist who lives right in our midst in Alvechurch. Maybe I’m just the last to hear that this artist lives so locally. Born in Manchester, he grew up in the Ribble Valley and was educated in Blackburn. After taking a degree in Fine Art, Terence went on to the Royal College of Art in London to study for a Masters degree in Painting. Upon graduation he began exhibiting and selling his work, firstly in London and then through a variety of galleries in the UK. Terence’s work is in some important collections including The Contemporary Art Society, Dudley Museum & Art Gallery and the Royal College of Art archive collection. His work is also in many private collections in the UK, Holland, France and America. He has written extensively for periodicals including Artists & Illustrators magazine and contributed to various books on technique and painting materials, most notably The Artist’s Handbook and Still Life by Betsy Hosegood. Terence’s work relies on excellent drawing skills followed by paint, which is applied generously in rich bold strokes. Themes range from landscapes in France to still life and occasionally figurative work and portraiture. 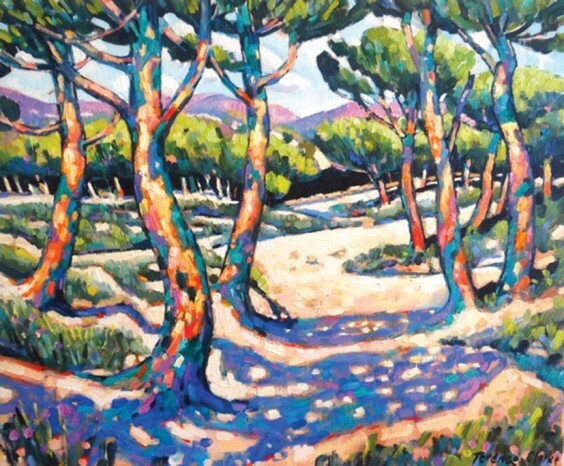 Terence’s work is focused on the use of vibrant and audacious colour. He says, “In a sense I am a painter of light. I use colour as a way of emphasising the drama of light. Intense colour is a metaphor for light itself and often this sense of light is the underlying subject of my paintings. Terence’s work continues to be popular with collectors of contemporary art. Modest in scale but technically complex, it seeks to refresh our vision and make us look again at the extra-ordinary quality of the visual world. Terence’s next exhibition is at Thompsons Gallery in Aldeburgh, Suffolk, starting on July 11 and ending on July 25. Meanwhile, at a more local level, Bromsgrove Arts Festival starts in June. The musical aspect is well promoted and there is lots of it from opera to folk and pop. But, as art is my main interest, here are a couple of local opportunities and exhibitions – not to be missed – which are both part of the Festival. First is the annual Bromsgrove Art Exhibition, running for two weeks between Saturdays June 20 June and July 4. It is open on weekdays 10am–4pm, and Sundays 12noon–4pm, at St John’s Church, Birmingham Road, Bromsgrove B61 1AA. There are usually more than 300 paintings to view or buy, ranging in price from £10 to hundreds of pounds, with a huge variety of subjects and sizes – so something to interest everybody! Then Avoncroft Arts Centre holds its annual exhibition over the weekend of Saturday June 13 and Sunday June 14 in the main hall. This will showcase paintings, textiles, pottery and other craft items created by class members. See http://www.bromsgrovefestival.co.uk for anything to do with Bromsgrove Festival – it is a fantastic new website if you want to see what’s going on or book tickets for events.